Awesome Finish on America's Got Talent! What a night! We are so proud of AcroArmy and their incredibly strong finish placing third on Americas Got Talent! ATA wants to thank all the loyal acro fans for their support and votes. A big thank you to Arthur Davis for leading this amazing effort showcasing acro to all of America! Acro Army finishes third in this season’s America’s Got Talent! With the best performances of the competition, America’s Got Talent wrapped up at Radio City Music Hall last week! The votes were counted and Acro Army ended in third place! The group wowed the crowd with high flying, throws, edge of your seat catches and a breath taking four-high pyramid that had the audience coming out of their seats! ATA’s Bryan Allen and Brennan Atsatt, who have competed as an elite men’s pair for the past 2 years on our competitive Acrobatic Gymnastics Team, could not have been happier with their performance! 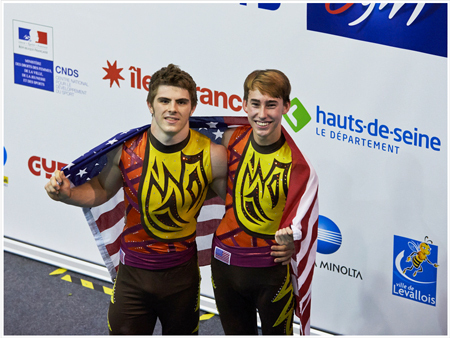 It was another amazing experience for the pair who trained and competed successfully for the silver medal at the 2014 World Age Group Championships this past summer in Paris, France! This spring, the boys were approached by Arthur Davis, long time Acro competitor and 2 time World Champion, to join a seasoned and talented group of 17 athletes from all over the US. Arthur competed with his partner, Shenea Booth in the first season of AGT making it to Finals! Arthur’s vision and dream was for Acrobatic Gymnastics competitors to showcase amazing acrobatic talent, artistry and drama in a group that would compete against talent from around the country on America’s Got Talent. They called themselves AcroArmy and have taken this season’s competition by storm! We know and have worked for many years with these athletes as well as worked closely with producer and choreographer, Arthur Davis. So it was no surprise to see them succeed in advancing to the top 6 finals and then on to a third place finish! This weekend they will join the top groups of this season’s AGT and showcase their amazing talents at Planet Hollywood in Las Vegas, NV. Gym owners, Bob and Pam Meier, along with our Acro Management, coaching staff and all our team members could not be more proud of all of these competitors! Follow AcroArmy on our Facebook Page! Keep up to date on all the latest information about AcroArmy! We will be posting updates as they come in to our Facebook Page.